On the 3rd of July, 25 Mandela Washington Fellows (Young African Leaders) gathered at Casa Marianella to enjoy a wonderful, warm evening full of fellowship and to share a meal with Casa’s residents and staff. 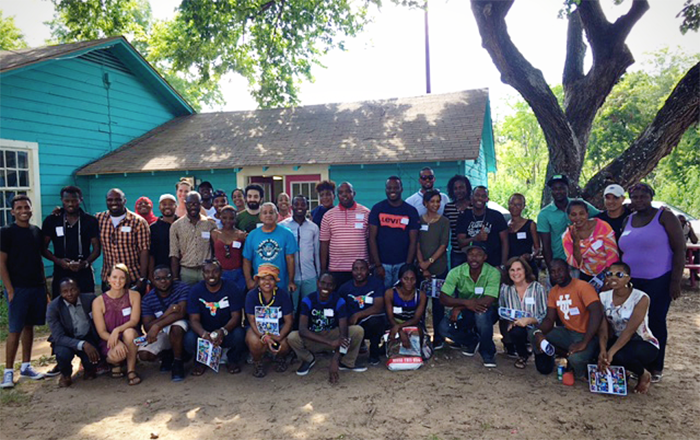 This meeting was a part of the MWF student’s community service component while participating in a six week MWF-YAL Institute/Business & Entrepreneurship Institute at the University of Texas. This program was developed in collaboration with the McCombs School of Business. Community service is one of six components of the MWF-YAL Institute at UT. MWFs are involved in weekly community service activities. The purpose is to gain a better understanding of the role of volunteerism and giving in the American society. Leaders share information about the community needs their organizations seek to address and how they succeed. Examples may include Southwest Key, Capital Area Food Bank, Casa Marianella, & Community First! Village.